High quality materials and attention to detail for a large property. 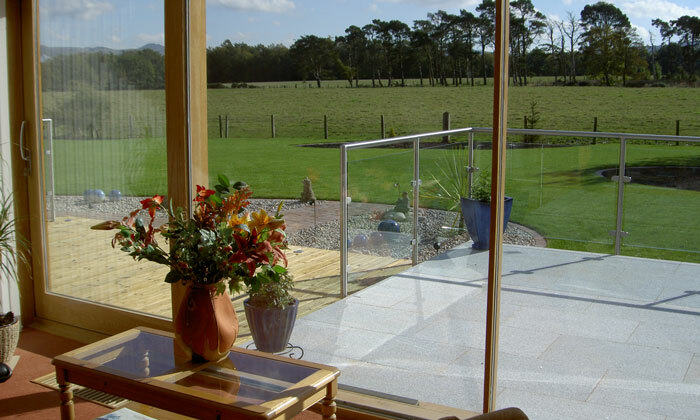 This project was the second job for this client who had previously lived in Livingston where my design for that property created a garden that added huge value to the house and was a big attraction for the family who bought the house. This client knew from experience the value of a good design, produced by an experienced Landscape Architect, so they were very keen for me to survey and design their new home. This new property was very large and quite exposed and they needed me to co-ordinate with their architect who was managing major renovations and extensions for them. I co-ordinate regularly on projects with architects to deliver well organised and cost effective projects for clients with a consistent attention to detail inside and out. This design required a lot of development with the client to get the details and choices of materials just right for them, their budget and the property. The client was delighted with the end result and that I had managed to repeat the same level of success in their new property. The design created a far more useable garden than the client expected with every aspiration realised and the works were done to their great satisfaction on budget, matching my estimates with no additional costs.